Social media is rapidly changing every day, so imagine what has happened in a year! We are curiously following social media updates and see how we can make the best use of them in the future. We are kicking off the blog with the leading changes on Facebook, who had some of the most interesting developments in 2016. An amazing new feature appeared at the start of 2016, getting us more than excited about new ways to display beautiful content with the help of ads. Facebook Canvas is a customizable digital space where all types of media can be built to create a high-quality ad. This allows a full-screen to open in the news feed for an experience filled with video, images, text and call-to-action buttons. The purpose of Canvas Ads is to tackle past problems with ads not loading on mobile properly and is designed to help businesses tell stories and show products on mobile devices. Burberry created a beautiful Christmas advertisement on Facebook with this tool! One of the most drastic changes on Facebook in 2016, have to be the Facebook Reactions. Users have wondered for years if there ever would be a ‘dislike’ button; Facebook has decided to create an extension of the Like button instead, to give users more ways to share a reaction in an emotional way. The first brand to make the best use of this feature was car brand Chevrolet. The simple tagline ‘From Like To Love’ covered a brand understanding a big change on social media and using it. Some have argued the Facebook Reactions might be useless information for brands or may even let pages look bad. A good thing to remember is Facebook treats any type of reaction (angry, sad, love) the same as a previous ‘like’, meaning this will not affect your post any different. However, Reactions do still have the potential of working very positively or negatively. With the right strategy, this is a great opportunity for brands to better understand how their audiences are responding to content. But how? Start investing in tools that translate sentiment of your audience. What triggers more sad faces? Why do people love? Keep adjusting and keep learning. Secondly, ensure your ad content is going to audiences who find this relevant. Users who are displeased to find irrelevant ads in their timeline might come to chase you with pitchforks and a bunch of angry faces. Facebook reduces much-hated clickbait in news feed. The times of “You’ll Never Guess What Happens Next!” will hopefully be a thing of the past. With the update to your news feed, this type of headlines will be ranked lower and more relevant content will show first. Another positive upside for businesses is they will be allowed a higher rank in timelines (as long as you keep away from clickbait-y titles). Following up of the success it achieved since the summer of ‘15, the social media platform has blasted off a huge boost for Facebook Live. Besides the feature being available in Facebook Groups as well as Events, Live Reactions has been added. This makes it easier for viewers to express their thoughts and feelings while airing. One of the most viewed videos of 2016 was made with Facebook Live by the unforgettable Chewbacca Mom. Live video on Facebook allows for brands to truly connect and engage and respond to their suggestions and questions. Initial data from Facebook has already shown people comment more than 10 times more on Facebook Live videos than regular videos – a sizeable guarantee for success, it seems. As one of the firsts, UK Brand Asos gained a sizeable audience with Facebook Live. Trying out 100 layers of Asos fashion in under 30 minutes not only had the crew smiling; about 63.000 viewers latched on to the live video. Asos showed brands the way of incorporating live streams into your brand strategy. After receiving feedback from users about irrelevant and disruptive ads, Facebook is adding the option to remove these from your interest. This allows users more control about the type of ad they will see and how their data informs the ads they see. Read more about dealing with ad preferences here. 6. Bye bye, 20% rule! Hooray! 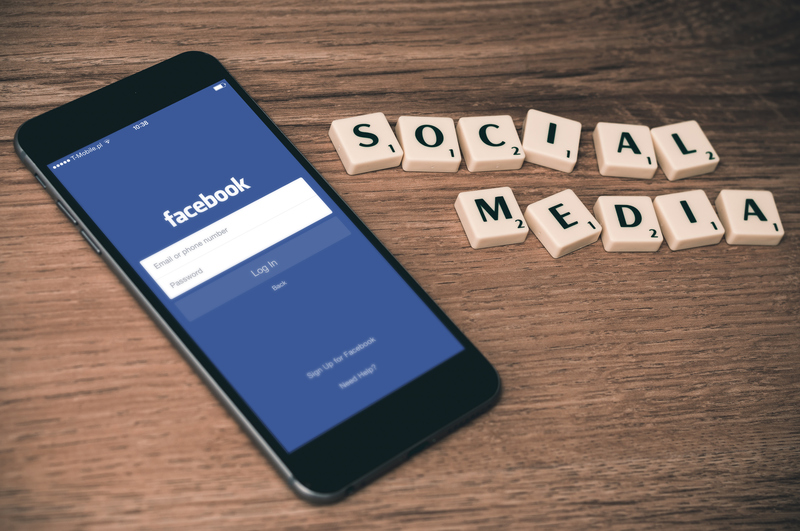 This year is a good year for social media marketers: Facebook has finally decided to ditch the harshest rule of them all. 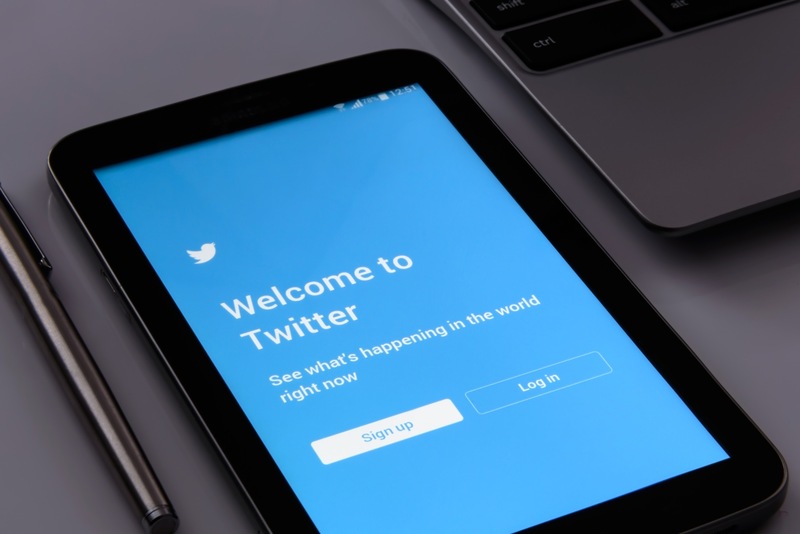 Previously, businesses were limited in the amount of text on an image to safeguard the user experience and keep timelines free of commercialized images. 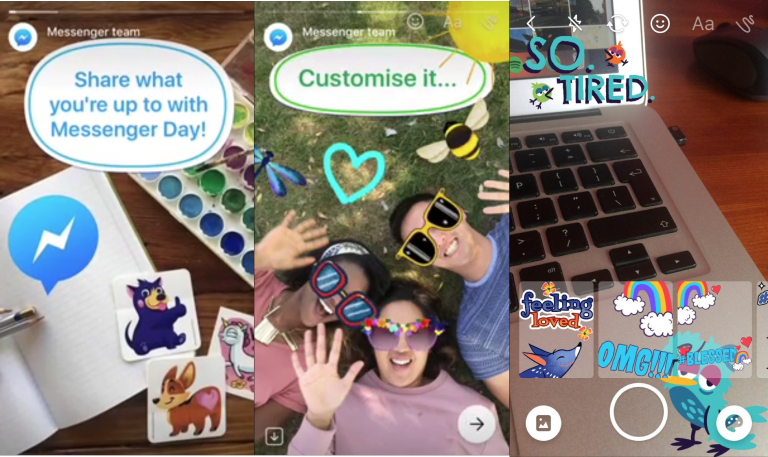 Facebook launched Messenger Day, a tool in Facebook chat which allows users to share photos with filters or added doodles. Shared videos disappear in 24 hours; the function which Snapchat has gained its fame from. It has been speculated Facebook released this tool in countries where Snapchat is not available yet, taking a full charge on the currently most popular social network for teenagers. That was not the only thing Facebook had in store for Messenger. Earlier this year, the social media platform announced it would add a feature where publishers use the bot-based service to share stories with readers on Facebook Messenger. 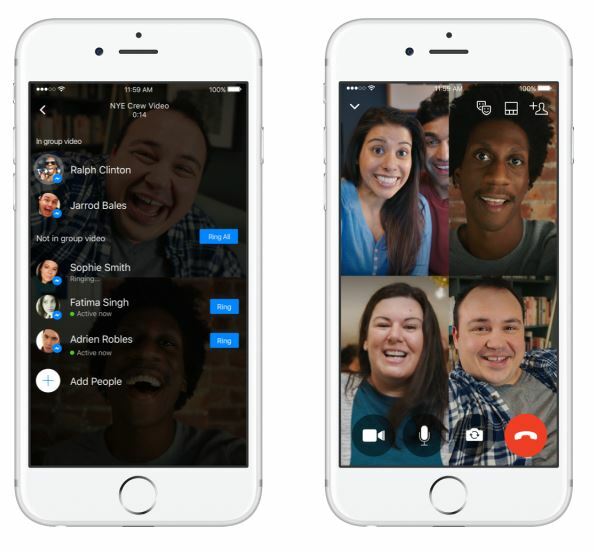 Now that Facebook is chasing the crowds that are currently on Snapchat, some brands have started to use the new functions of Facebook Messenger to their benefit. CNN was one of the first publishers to join Messenger’s bot platform and use it to their benefit. It sends subscribers a daily digest of top stories within the app and also recommends personalized content based on previous user preferences and interests. Adding to that, live video and Group chat are available after many requests, and as a bonus, it added temporary video stickers for Halloween. The chase for a Snapchat-type platform seems to have worked out pretty well! 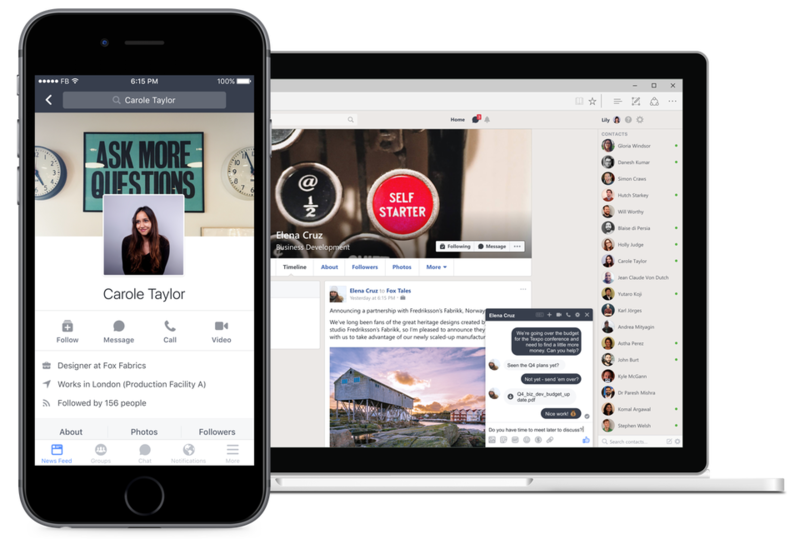 Facebook’s most new feature, Workplace, is one we wrote about earlier this year. Workplace is developed to support chat and collaboration within businesses. Employees from different organizations are able to communicate. This has opened up opportunities for businesses to both internal conversations as well as expanding to new grounds. Currently, more than a thousand organizations around the world are trying out Workplace. In addition to creating this platform, Facebook is running a test page for Page admins to create job postings and receive applications from candidates. This means Facebook will be directly competing with the most used social media platform for business, LinkedIn. It has been a turbulent year for Facebook, and we can’t wait to see what they have in store for 2017! Have you enjoyed the new features as much as we did?